August has been another good month for eBay finds! I've picked up some amazing brush set which I blogged about separately here, along with quite a few accessories and some beauty treats... just because! Below are all my eBay buys for the month which I'm so pleased with, well except for one product that I'm so sad is a totally awful product but looks amazing... can you guess which one it is?! First up I thought I'd start with accessories as I picked up some gems this month. 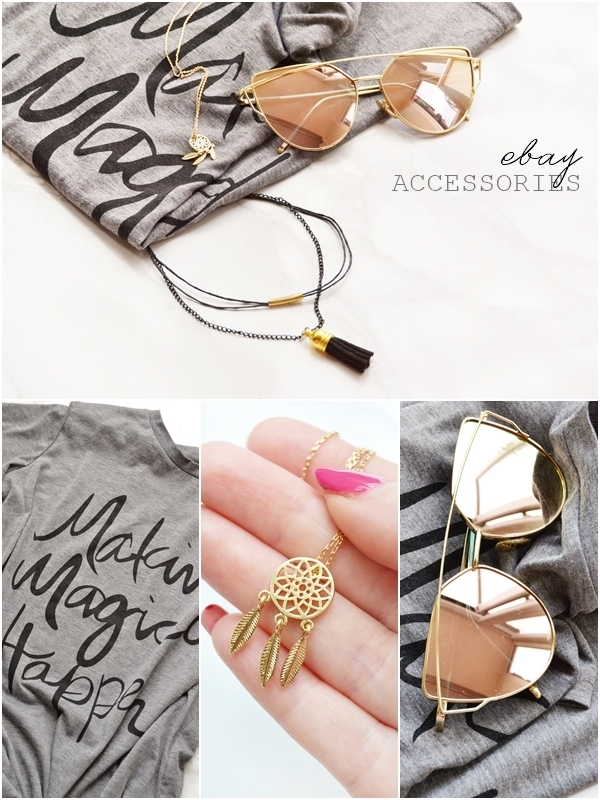 My favourite accessory has to be these rose gold metallic sunnies that I've featured in a few eBay Bargains posts. Not only have I seen these exact sunglasses being sold for £10-15 online but they always seem to sell out quickly, so I was pretty pleased with my find... and I'm sure you'll agree that they do look more expensive and similar to Quay sunglassess! Due to the rose gold these really brighten up the face and the shape is actually so flattering. As for the quality I'm really impressed for the price and they don't feel cheap or like they will break. As I love these so much I've ordered the black frames with red/orange mirrored lenses - I can't wait for them to arrive now! When it comes to jewellery I'm all about cheap but pretty pieces, I don't wear a watch or any rings on a daily basis, so I like to impulse buys budget items that catch my eye. Which is why I picked up this lovely dream catcher pendant. At 99p you never know what the quality will be before it arrives but I'm certainly happy this time as I love the matte gold finish to the main part and then the little etched feathers that nicely catch the light. I'm also really impressed with the detail especially as it's quite a dainty piece (around 10p size) and I'm certain no one would ever guess it was such a cheap item. I've already worn the necklace a few times but I can see myself wearing it quite a bit come Autumn/Winter. Another necklace I impulsively bought due to the low price and again I'm more than pleased with the quality and how it looks. Again lots of detail to the necklace for only 99p, such as the faux suede tassel on a black metal chain and the little gold bar to the choker. This is comfortable to wear and fastens with a standard necklace clip that can be adjusted to size. I think I will buying a few more chokers from eBay now! Not really an accessory but another buy I took a risk with the quality and if it would actually fit or not! But thankfully both turned out better than I expected with the t-shirt actually being really good quality with a nice stretch to it and it fitting well, though I did go for an XL and I'm a UK 12-14! This is a slogan tee I've seen a few U.S fashion bloggers wearing in the past year and with it being grey and with a font I actually like I couldn't not pick it up. Very pleased I decided to buy this as I do normally avoid fitted items from China as their sizing can be off. Did I need another oval brush? Probably not. 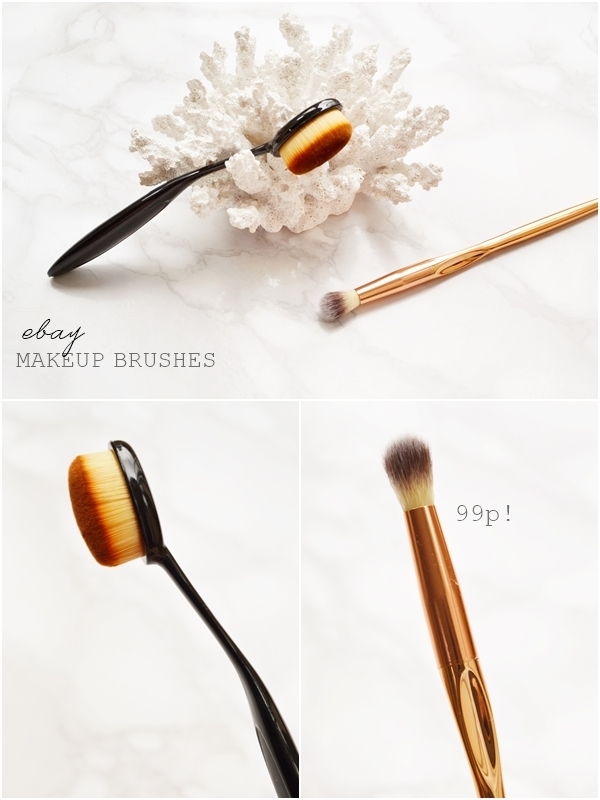 But oh well, under £2 is a bargain and I do love me some oval brushes. For the price this is a surprisingly dense brush with a good domed top. Yes, the plastic does feel cheap but you would have to press the brush against your face very hard for it to ever snap! However the ultra soft non-shedding bristles really do make up for the cheap plastic handle. For me this will be a good back-up brush for when my other foundation brushes are dirty. I already own this specific brush (from buying this 5 piece set) but as I loved it so much I had to get another. I love when I come across fluffy blending brushes that just works and this is one of them. I love everything about this brush, especially the rose gold finish and the indent to the handle of where to hold it. I really can't get over that this brush cost me only 99p - amazing! Right now you are probably ooo'ing at how amazing this lipstick looks. I know I certainly was when it arrived and it is a thing of beauty.... however it also my fail buy of the month. I've purchased a similar clear lipstick like this before and it turned out to have an awful taste/scent to it, but I thought it was a just a one-off; sadly not! On the lips this has an awful taste that's slightly musty smelling and for that reason I just can't wear it. This does happen from time to time with items and I'll know now never to purchase lipsticks from China based sellers on eBay again. Side note - I will be requesting a refund for this item and from past experiences it should be accepted as sellers don't want to risk their star rating. 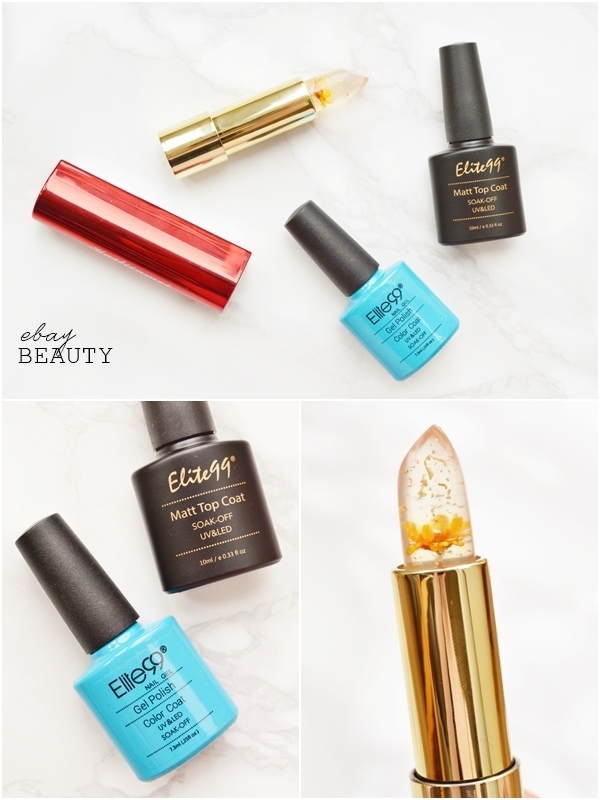 Recently I've been getting into gel nails thanks to the Sensationail Polish to Gel Kit (see my review here) so I thought I'd try out a few cheap gel polishes from eBay to see how they fair. I've yet to try either of these polishes out so I can't give a mini review but I'm looking forward to trying out the matte top coat especially and the gorgeous vivid blue on my toes. 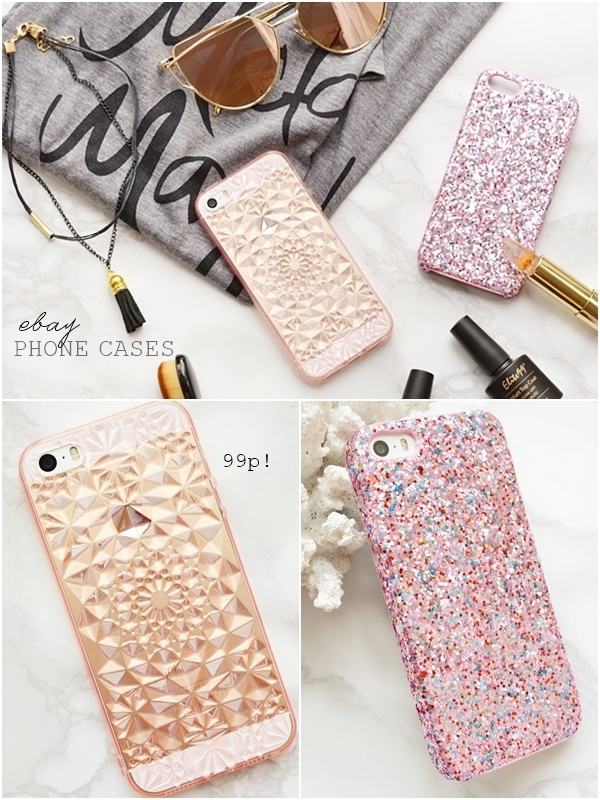 My phone case obsession continues! Yes, I picked up yet more phone cases this month and I'm not sorry about it. First up I have this gorgeous 3D transparent rose gold cover that's currently on my phone and looks amazing. I imagine it would look even more amazing if you have the iPhone 6 or 6 plus with the rose gold back but on my 5s I'm still really happy with how it looks. It also feels really nice and is made from a sturdy silicone that fits the phone perfectly. Yes, yes, yes, to this buy! 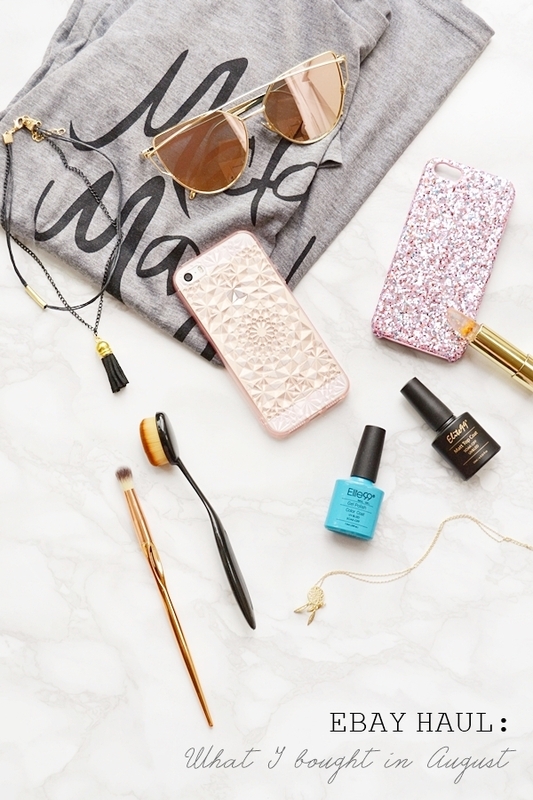 I also decided I needed a Kate Spade style glitter phone case in my life so I picked up this dazzling pink multi glitter beauty! I have a feeling this may pick up fluff from clothing etc when the glitter catches on things but I really don't care because it's so pretty and exactly what I was looking for. This also comes in a range of different colours, all of which look great and it's a hard case. So many items this month that I'm more than pleased with! Hope you've enjoyed this month's eBay haul - you can find last month's haul here.